According to a 2016 poll by the independent Levada Center, 80% of Russians view television as thier primary source of news. The same Levada poll, however, shows that only 41% trust the news as an objective source of information. The broadcasts sampled here are from Russia’s most-watched channels: First Channel and Russia Channel. To receive SRAS’s free monthly newsletter (which features new issues of this news resource) by email, simply sign up. In his Address to the Federal Assembly, First Channel reports that President Putin focused on the idea of “consolidating Russian society.” Vladimir Putin denounced “attempts to divide the nation along the cultural or historic lines,” said that “the elite mustn’t swagger, mustn’t be arrogant and egotistical.” He was also quoted as saying that “censorship in culture and media cannot be tolerated,” but also that “speculating on complicated events in Russian history is not acceptable.” He was quoted as saying that consolidation has “enabled Russia to withstand unprecedented pressure, more than at any other time in the last 50 years” and that “the next goal is restoring rapid economic development for the country.” The President rejected “the grey forecast of the Ministry of Economic Development, with the economic growth slightly higher than zero” and “set the goal to achieve the growth higher than the average growth worldwide.” Currently, First Channel clarified, that is four percent per year. The full, new economic development plan is to be presented in May, First Channel reports. Where are the Boundaries of Decency in Creativity? First Channel reports that at the meeting of the Council on Culture affiliated with the President, the issue of forbidding theater plays and exhibitions by some officials (allegedly, lower-ranking officials in regional governments), was discussed. The President said that such actions are unacceptable and they should be prosecuted as illegal. In addition to the arbitrary acts of officials, there are cases when hooligans rush into exhibitions and spoil the exhibits, protesting against art projects they don’t like. Vladimir Putin recommended developing criteria for evaluating an art project, to be able to make a well-balanced judgment where the boundary between provocation and insult is. First Channel quotes President Putin as saying that a large-scale program of improving school education is underway, in order to create “comfortable” conditions for children. Putin’s assertion that school should teach morality was emphasized by showing leaders of the Russian Orthodox Church and Islamic organizations sitting in the audience, nodding in agreement. The report also stated that schools are being renovated and built all over Russia with additional teachers trained to address shortages of classroom space and time. 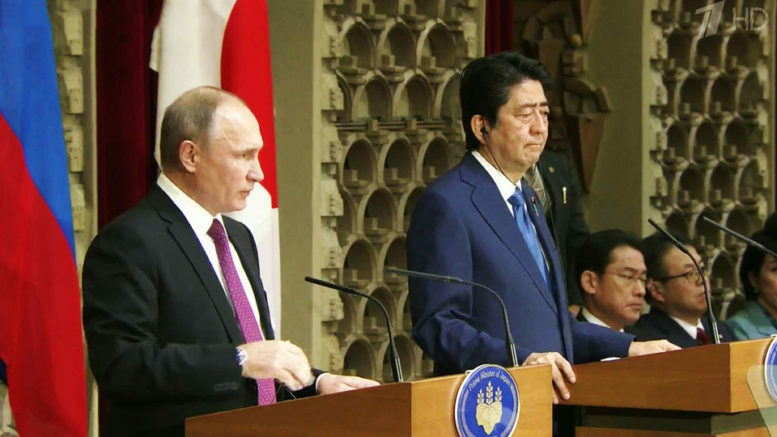 First Channel states that Prime Minister of Japan Shinzo Abe invited President Putin to Japan “despite the threatening shouts from Washington” as “Japan wants an expansion of cooperation, not sanctions.” According to First Channel, Japan has offered to start intense economic development of the Kiril Islands, which have been largely undeveloped and disputed between Japan and Russia since WWII. Economic cooperation in developing fishing, health care, and tourism was discussed and 68 related agreements were signed. According to First Channel, Carter Page, a former advisor on foreign policy matters to newly elected US President Donald Trump, visited Moscow, without any official appointments scheduled, and made the statement that he “sees no obstacles for the US authorities to recognize Crimea as a part of Russia.” “It is pleasant to hear. We will wait and see,” First Channel commented. First Channel states that “Russians are blamed in all the problems of Germany and the USA” which the channel calls “the signs of paranoia.” As an example, First Channel quotes Hillary Clinton as saying that Vladimir Putin himself was directing the hackers’ attacks on the US election system, the statement of the former Secretary of the British Cabinet Ben Bradshaw that Russians are involved in the Brexit vote, and even some allegations of an expert (his name was not stated by the channel) that Russian special services might be involved in the street attacks in Cologne on the New Year’s eve in 2015. Russia Channel reports that the annual press conference of President Putin had the record number of reporters attending, and lasted four hours which is usually short for such an event. President Putin answered 70 questions, stating, among other things, that 5,000 rubles will be additionally paid to pensioners at the beginning of 2016, and starting from 1 February, pensions would be adjusted to the inflation rate as before. Vladimir Putin warned that the USA, by withdrawing from the anti-missile treaty, is laying the ground for a new arms race. Answering the question whether Russians will remain invaders in the eyes of Ukrainians, Putin said that “it would be good if the Ukrainian army would not be considered invaders in Donbas.” He said that there are few opportunities for the cooperation between Russia and the West under the current conditions of sanctions. Andrei Nesterov has reported on political and social issues for the Russian press as well as American outlets such as Russian Life, Worldpress.org, and Triangle Free Press. He has travelled Russia extensively and penned many stories on the "real Russia" which lies beyond the capital and major cities. Andrei graduated from Ural State University (journalism) and Irkutsk State Linguistic University (English). He studied public policy and journalism at Duke University on a Muskie Fellowship and went on to study TESOL and teach Russian at West Virginia University. He is currently working on an MA from St. Petersburg State in International Relations. Andrei contributes news, feature stories, and language resources to the SRAS site, and is an overall linguistics and research resource. He additionally helps coordinate activities for our students in Moscow.